I went through the wagon today and fixed a bunch of dumb things. All of the mirrors were loose. The headliner was falling down. Mostly I found that the A/C had a leak in the low side shrader valve core. So I put a bicycle core in their until I find out if the system leaks or not. That fixed it. I pumped it up with 108 psi of compressed air, with the compressor disconnected. That way when I check it in a week I’ll know for sure if it’s air tight or not. 108 psi is over 4 times the pressure that a 28 inch vacuum will create. So it’s a good method that I’ve used for years to make A/C systems reliable. I do need to find out if the bicycle shrader core is compliant with R12 oils and refrigerant. 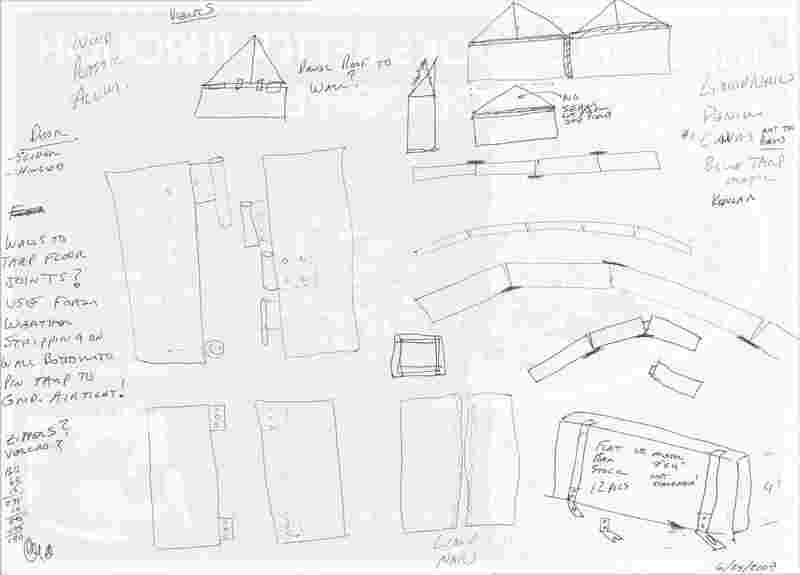 Here is our concept sketches of our Yurt. It was made tonight on the back of a Denny’s paper place mat. This is when we first documented our idea of a Yurt that has the roof and walls folding out from one continuous piece, and our internal anchoring system. This past weekend Bill and I went to SoulStance. It’s a warmup for Burning Man. I met some great Burners that answered all of my millions of questions. No one gave a thumbs down to our idea of making a foamboard Yurt. Below are the notes that I took. I remembered using the cooling vests and bandana’s from hot weather motorcycle riding for cooling folks off. I think that it would work great at BM. There are sites that have DIY pages so you can make your own. Here is a link for some nice commercial versions. Hats with strings – 2 hats! 2 pairs of shades -> Snow blind! Yurt Cooling? Evaporative? Wind Powered?